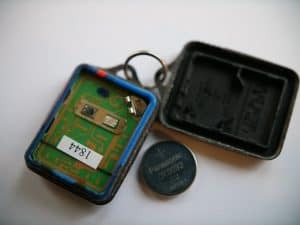 Modern car key fobs usually contain replaceable small “watch” batteries. Some key fobs make accessing the battery easy, others require a bit more elbow grease. 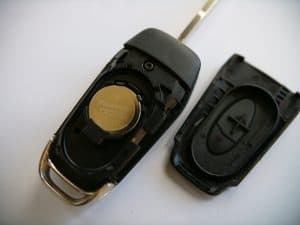 This is key because non-rechargeable batteries, like the common CR2032 or CR2450 batteries found in most car key fobs, are usually easy to pop in and replace quickly. Rechargeable batteries however, like the VL2020, often involve more tools to replace the battery. You may need such tools as a soldering iron to remove the battery from a circuit board, and super glue to secure the key fob back together. This key fob has a back that pops out with a little pressure from a hole near the top of the fob. Depending on the design of your key fob, you’ll likely have to pop off a piece on the rear of the key fob. The BMW key fob to the left of the page here has a back that pops off when pressure is applied from inside the key from a hole in the top of the key. Key tip: Always try to remove any internal or valet key first, and look inside that hole to see any indentation that may contain a good spot to leverage a flathead screwdriver in to pry apart the fob. This key fob from a Ford F-150 required scoring the edge with a box cutter. 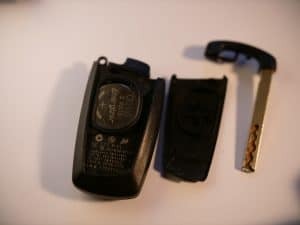 It does contain a replaceable CR2032 battery. After replacing a battery in a fob like the one above, you’ll need superglue to re-attach the two pieces of the fob back together. Luckily most key fob batteries only need to be replaced every 4-7 years, so this isn’t a once a year project!